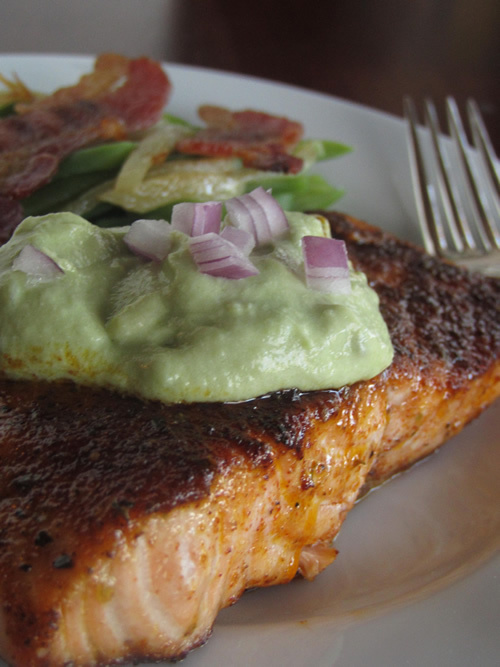 Ancho-crusted salmon with avocado crema | Ancho-crusted salmon with avocado crema – oh, that's tasty! 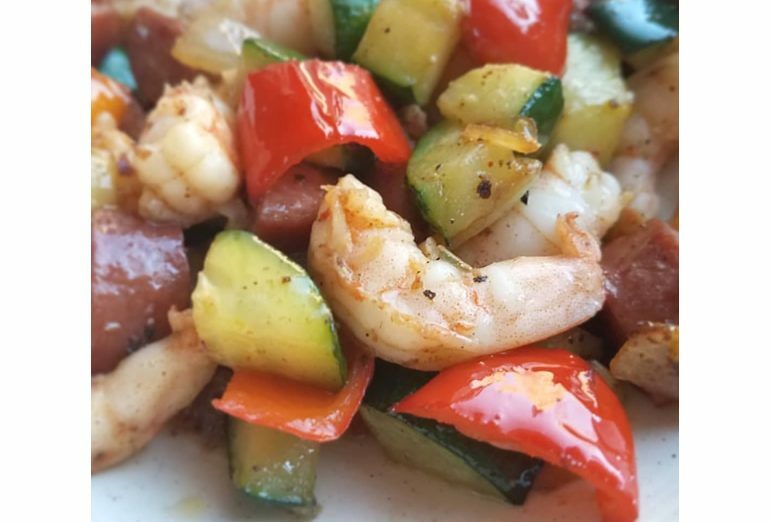 This dish is delish — I mean, truly restaurant-worthy — but it’s also super easy and totally healthy. I have to give the hubs partial credit for this one. I had made this spice-rubbed salmon for dinner one night, but hadn’t really figured out a vegetable to go with it, and Eric was doing Phase 1 of the South Beach Diet (which is NO carbs), so I served the salmon with some romaine spears alongside and some ready-made guacamole to dip them in. 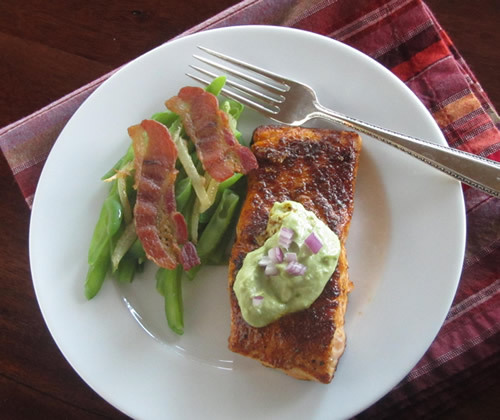 But instead of using the guacamole as dip, he put it on top of his salmon — and loved the combination! Since then, I’ve evolved the recipe a bit. 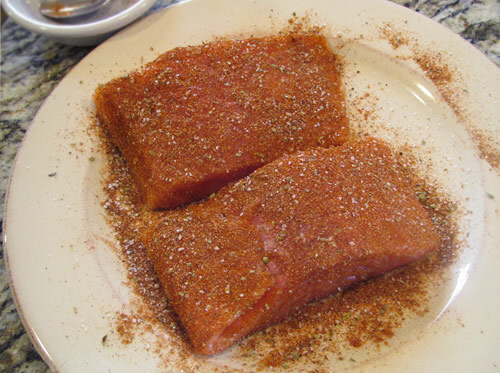 I started out with a recipe called “Broiled BBQ-spiced Rubbed Salmon,” from The Sonoma Diet Cookbook, but I’ve tweaked the spice combo each time I’ve made it, and I was really happy with the way it came out this last time I made it. For the guacamole, I use Wholly Guacamole brand, and it comes in these boxes that contain individual-use packets. Which is just brilliant! 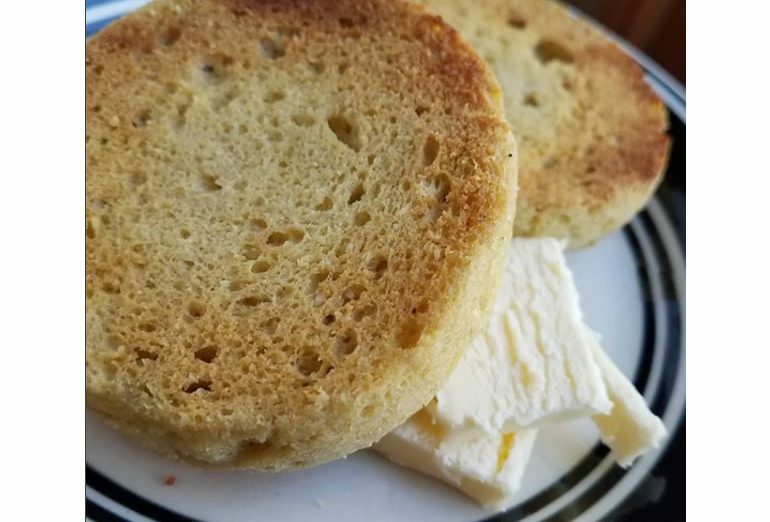 If you just need a bit for a recipe, or you just want a quick easy snack, these are the perfect size, without the risk of the rest of batch turning brown before you can use it. I use the “Classic,” but they also make a “Spicy” version. You will preheat the broiler later in the recipe. Mix together all of the spices in a small dish. Before you begin to season the salmon, fold any super-thin edges under (or over) so that the thin part is doubled, and the fillet is a fairly uniform thickness across, like this. Just press it down a little with your fingers; the fish is a bit sticky, so it will sort of adhere to itself. 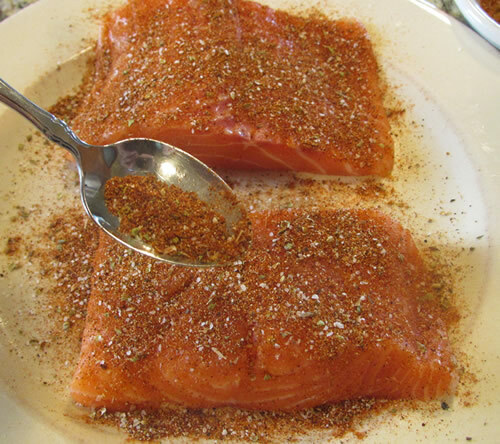 Next, sprinkle half of the seasoning mix over the top side of both fillets. Pat the spices gently onto the fish. Then turn them over and season the other side, using the rest of the spice mix. Move your top oven rack to 4 to 6″ below the broiler, and preheat broiler. 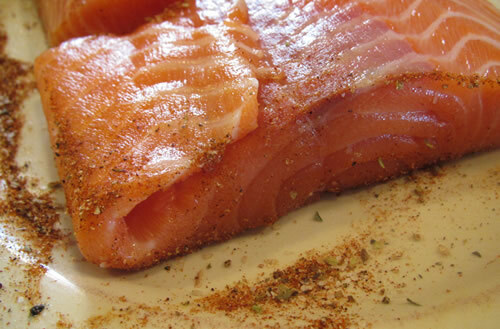 Let the spiced salmon sit at room temp while the broiler heats up. Then place them in the oiled pan, folded side down, and put the pan in the oven. Remember your fish thickness in inches? Now’s when it matters! Cook your salmon for 10 minutes for every inch of thickness. So if your salmon is 3/4″ thick, cook it for 7.5 minutes. 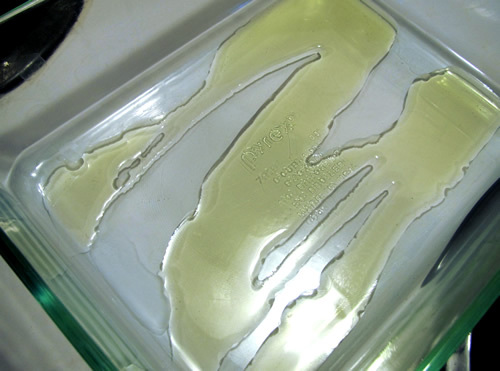 1″ thick: 10 minutes. 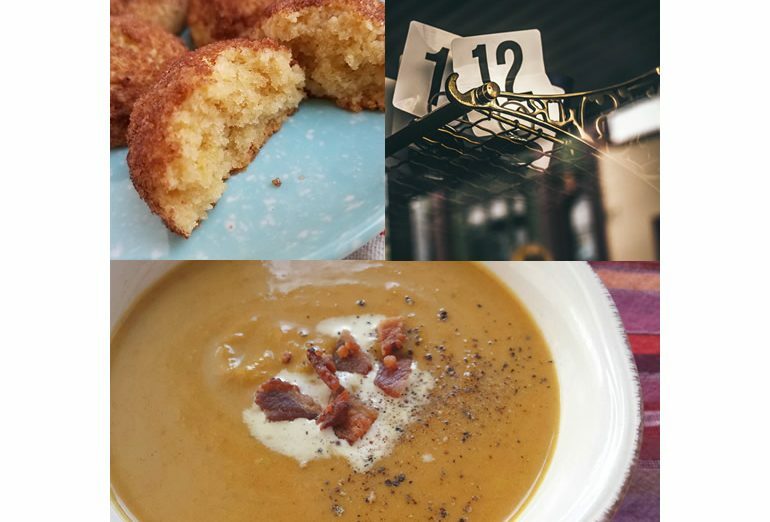 1.25″ thick, 12.5 minutes. And, turn it over once, half way through baking. 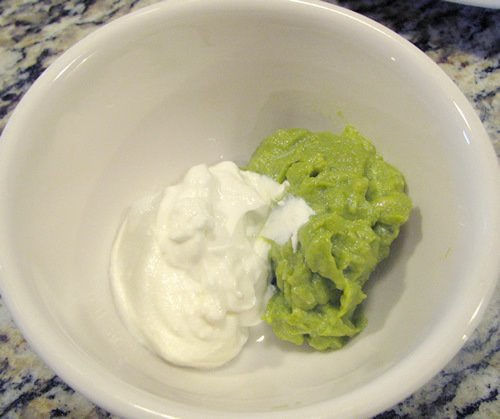 While the salmon is cooking, mix together the guacamole and the yogurt. I don’t bother to measure the yogurt; I put the guac in first, then just “eyeball” the yogurt so that it looks like about the same amount. Stir till well combined, and set aside. Have you turned the salmon over halfway through the baking time? Don’t forget! If you’re using diced onion for garnish, now would be a good time to dice it. So when the salmon is done to your liking, pull it from the oven, put it on serving plates, and top with the guacamole mixture. Sprinkle diced onion on top, add your side dish, and serve. This time, I did plan for my side dish: French-cut green beans (from frozen), steamed, and topped with sauteed onions and crispy bacon. The smokey note in the spice crust of the salmon played nicely with the slightly-smokey bacon. There’s a dish dressed to impress! Made this last night, delicious!!!! !